In Part 3 we touched on how to define strategic goals, position, and create a go-to-market plan that is most relevant to an as-a-Service offering. If you haven’t read the previous parts, you might want to take a quick look before returning here. In this installment, we will discuss the key metrics to track and capabilities to nurture to ensure you execute this transition successfully – along with a few tips and tricks I have learned (often the hard way) over the years. This series makes no assumptions about prior experience with as-a-Service models. It is equally applicable to companies that have technology at their cores and those that don’t. A massive amount of content has been written on related topics and the main goal here is not to repeat or replace that, but to simplify and help you begin – or at least consider – the journey. The title of this series talks about “Profitable, Recurring Revenue Streams” but, so far, we have spent a lot of time reviewing the ‘recurring’ element and less talking about profits. Now it’s time to address that. A note about the audience for this article: What follows is a discussion of metrics and financial models primarily for the CEO or executive who is not a financial professional. 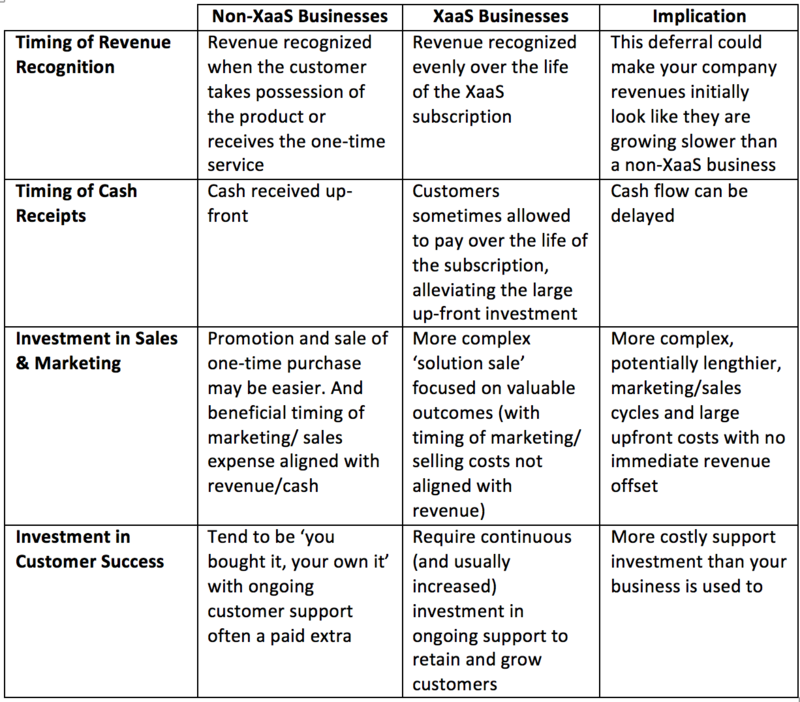 (For you CFO-types, I recommend The SaaS CFO blog as a good resource.) I have simplified concepts wherever possible to make them understandable but precise accuracy of terminology or calculation is sometimes sacrificed. As a former public company CEO myself, I fully realize how complex FASB/IFRS and GAAP accounting rules are (especially for public companies or those that want to become one someday). When the time is right, always seek the help of an accounting professional. Key Metrics Taken all together, it’s not hard to see that shifting to a XaaS model could have a significant impact on profitability (at least initially). In fact - in the near term - the more you sell, the more money you are likely to lose! So why would anyone want to transition to such a crazy model? Apologies for starting on a negative note, but one of the most important metrics for a XaaS business is the rate of customer departures or ‘churn’. Usually this is expressed as a percentage of existing clients that depart for the period you are considering (monthly or annually). For example: if you have 100 customers and, on average, two of them cancel or do not renew their subscriptions each month, then your churn rate is 2%/month. On a more positive note, the concept of ‘net churn rate’ has been created to account for the net impact of losing some customers in the period but also expanding others to buy more of your solution. Extending the example above: if your monthly churn rate was 2% but you increased your revenue from existing clients by 4% (by up-selling an enhanced service or cross-selling a different offering) then your net churn rate is +2%. XaaS financial models are very sensitive to net churn rates, which is one reason why the Customer Success function is so critical to XaaS businesses. Obviously, since it accounts for the addition, expansion, and churn of customers, this is one of the most important and closely watched XaaS metrics. Obviously, a lower CAC is better than a higher one and understanding this metric in your business can lead to good discussions around the efficacy of your go-to-market model and whether particular marketing/sales initiatives are driving your CAC up or down on average. Obviously, the higher the churn rate, the lower the average LTV of your customers. Now that you have the LTV and CAC estimated, it is possible to calculate the LTV/CAC ratio. As you can tell, this one metric basically incorporates all the previous metrics. Given the margin structure that Software-as-a-Service businesses generally target, a LTV/CAC ratio of 3.0 or better is a common goal for high-growth businesses. Below 1.0 shows a business that is having to spend too much to acquire clients relative to what they return. A ratio above 5.0 might indicate you aren’t spending enough on acquiring customers – that there is lots of untapped market opportunity to take advantage of. The value of this ratio that makes the most sense for your business will depend on your margin structure and your appetite for investing in future growth. To calculate this for yourself, you need a model. By now you have probably gathered how a XaaS financial/business model would be constructed, based on the key model inputs described above. Pretty simple. Because CAC is $1000 and the price (paid upfront) is $500, the business is immediately in the positive by $500. In our super-simple model, this doesn’t change over time – which makes sense since non-XaaS businesses generally have to ‘re-sell’ their customers to get them to buy the next product or enhancement. Now how does this compare to our XaaS model? One word: yikes! 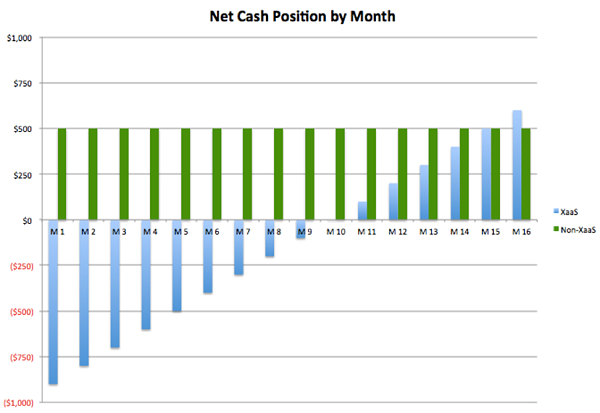 While the non-XaaS business remains cash-flow positive $500 all the way through, the XaaS version of this model loses $900 in the first month ($100 MRR minus the $1000 CAC). 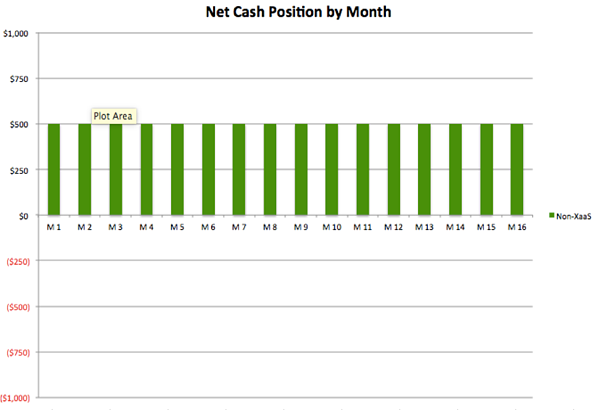 It’s not until month 10 that this customer becomes cash-flow breakeven. But something magical starts to happen in month 16. Now the full power of the XaaS recurring revenue model becomes clear. 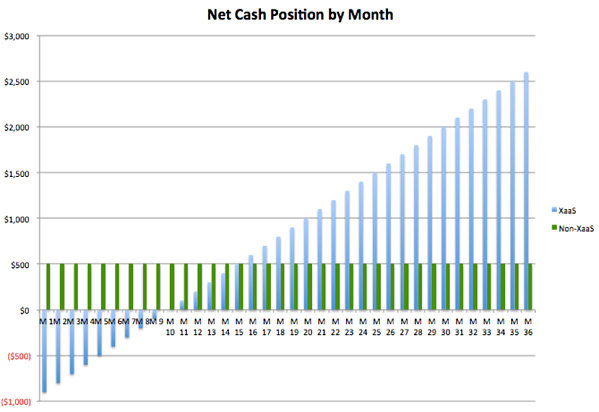 Since the customer stays for 3 years ($3600 LTV), the cash/revenue begins to really pile up. And if net churn was negative (you grew existing customers at a rate faster than you lost them) the curve would begin to arc up even faster! This chart shows fundamentally why CEOs are adopting XaaS models (and investors are rewarding those that have them). Now you may question the assumption of putting the non-XaaS price at ‘only’ $1500 while the XaaS MRR was $100. Hopefully the earlier installments of this series explained why this makes sense. As we discussed in the pricing section of Part 3, do not simply take your non-XaaS price and divide by the LTV period. A XaaS model provides continuous, ongoing, and ever-improving value based on the outcomes you are delivering over time. You are truly focused on the success of your customers. Yes, this model could cost more in developing/delivering the service but the net effect is still likely to be highly positive for clients and you should be able to price accordingly. Bottom line: your main role here as the CEO is to help set the key assumptions of the model. Building the model, itself, should be left to your financial wizard or spreadsheet guru. The NPS is the percentage of Promoters minus the percentage of Detractors. For example: if 50% of your respondents were Promoters and 20% were Detractors, your Net Promoter Score would be +30%. Benchmarks vary widely by industry but, in general, really good NPS scores are greater than +50, between 0 and 50 denotes that some work needs to be done, and below 0 is a huge warning sign of a solution/business in trouble. As you can tell from the metrics discussion above, NPS is even more critical to a XaaS business since the model is so sensitive to net churn (customer expansion minus departures). Improving or dropping NPS scores can form a powerful early warning system to use in predicting future trends of these key metrics. If you aren’t already using NPS (and many, many are) then you should begin immediately so you have benchmarks in place prior to your XaaS transition. Congrats – you have made it a long way! It has been my goal to provide a practical and actionable overview of the characteristics, reasons, and execution models that should apply to most XaaS businesses (or business transitions). It’s easy to talk from the world of theory but I, like you, am a practitioner in the real world. Over the last 15+ years I have been the head of marketing, head of products, and CEO of companies that have used XaaS models. In most cases, those companies were transitioning from a non-XaaS model (which I believe is even more challenging than starting one from scratch). Based on that experience, let me share with you a few final tips, tricks, and cautions. Don’t let the discussion of metrics and financial modeling trick you into feeling that transitioning to XaaS is primarily a spreadsheet exercise. As we have already been discussing in detail in this series, these two models require fundamentally different operating models. Because of that, it turns out to be very difficult for a company to run both non-XaaS and XaaS model simultaneously – and nearly impossible for the same offering. Every organizational ‘motion’ is so much different for XaaS that trying to do both usually results in neither method being executed well. Pro tip: If you are going to run both XaaS and non-XaaS models in your business, treat them as separate business units with unique and largely independent marketing, sales, support, etc. This may sound like you are duplicating effort in some areas. That may be true to some degree, but better to duplicate than to fail. An incomplete XaaS transition/model is the number one failure mode I have seen for companies attempting to use the model. Because NPS and net churn are such critical metrics in your model, it is more important than ever before to embrace a customer-first mindset and execution model. Pro tip: Fund this function appropriately. Hire the very best leader you can afford (hopefully with XaaS experience). And then give the team a quota for retaining and expanding customer revenues. The best laid plans…. Whether you are a new business or a mature business transitioning to this new model, most of your key assumptions will have inadequate grounding. Market and ‘voice of the customer’ research can definitely help – and should be carried out by an outside professional to avoid bias – but even small nuances in the offering and go-to-market model can result in big differences to the outcomes. As we have seen, there are many uncertainties and complexities involved in a XaaS transition, but the payoff can also be significant. Fifteen or even ten years ago, investors did not have a good understanding of the potential upside and were impatient with the negative short-term consequences of adopting a XaaS model. The good news it that this has now changed. Pro tip: Involve your investors early and often in the processes described above, including goal-setting, solution positioning, go-to-market planning, and financial modeling. And don’t forget that some of your most important investors are your employees. Perhaps you are the 100% owner of a private company – in this case, the investor you need to be direct and honest with is yourself! We have truly only scratched the surface but I hope you have come away with a deeper understanding of why and how to adopt a XaaS model. For more on this and other topics please subscribe to my blog at the bottom of this page and always feel free to reach out to me directly with questions, comments, or to learn more about Chief Outsiders at bmathieu@chiefoutsiders.com.